The POETS Young Scholars Research Program is an opportunity for high school students to advance their goal of pursing higher education. Our scholars are able to participate in an authentic research experience at a world-class research university, under the mentorship of a faculty member or graduate student. Scholars additionally receive one-on-one coaching and advising from a teacher mentor, who help coach the student through their research experience. Additionally, students participate in weekly seminars on various topics including research projects, college readiness, and scientific communication. The ultimate goal of this program is to make students feel comfortable in a university setting, form a science identity, and gain confidence in attending college. The summer of 2017 was our pilot year for the Young Scholars Program at the University of Illinois. The summer of 2018 we will be have our Young Scholars work on teams of two high school students and one high school teacher. This will allow more research progress to be made, and allow the students to gain more mentoring opportunities. POETS is also partnering with the Physics and Bioengineering (SPHERES) departments. We all have a common application with very similar programming structures. The only difference is the type of research you will do in each program. Pre-training will occur June 11th-June 15th. This will involve fun group activities, field trips, and campus tours. Six week research program dates are June 18 through July 27, 2018. Free lunch every day during the program. 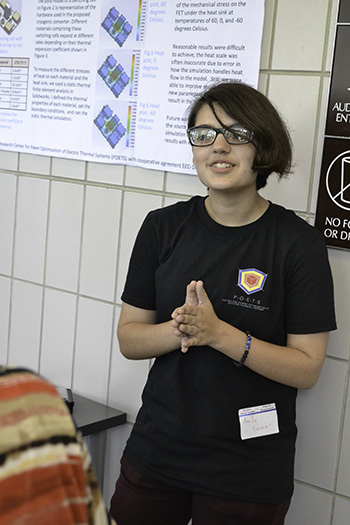 What's the difference between the POETS, Physics and BioEngineering/SPHERES summer programs? All programs have the same goals and program structure. The difference is the research you will be doing in each program. POETS: POETS does research in the space of electrical engineering, computer engineering and mechanical engineering. We work on electric airplanes, electric cars and electric manufacturing equipment. If you are interested in circuits, hands-on projects, building, or programming then the POETS program is right for you. Regardless of which program you are interested in, you will be applying through the same application system (see details below). In your essay, you can discuss which research you are most interested in getting involved in this summer. 500 words: OPENS APRIL 11th - CLOSES MAY 10th at 4:00 PM. For more information please contact Joe Muskin and Dr. Jessica Perez. POETS Young Scholar Avrille Turner presents her research during the poster session.